Gone are the days of rooms too pretty for entertaining and furniture too pristine to sit on. Now, it’s all about making the busiest room in your house the most welcoming. Let Furniture Fair transform your living room into a place that’ll make guests want to wear out their welcome with some of these must-have items. 1. A flickering fireplace: Whether you’re relaxing at home or hosting a party, nothing is cozier than a warm fireplace. Sure, bonfires are fun, but gathering around the fire to watch old home movies with a cup of hot cocoa is even better. Don’t worry if your home didn’t come with a built-in fireplace because technology has gifted us with standing fireplaces that can go anywhere in the room. Try this: What’s better than a combination TV stand and fireplace? Pretty much nothing. This Manning TV Stand with a Fireplace Insert by Twin Star International is on-trend yet classic. 2. Comfy seating: It’s one thing for a room to look appealing and a whole other thing for it to feel as good as it looks. This, of course, starts with furniture. Comfy cushions are a must for a cozy living space. Sofa? Sectional? Microsuede? Leather? It doesn’t matter as long as all your cares melt away the second you sink into it. Take things to the next level by arranging furniture for optimal access. Make sure there’s space between large pieces of furniture for you and your family to move with ease. 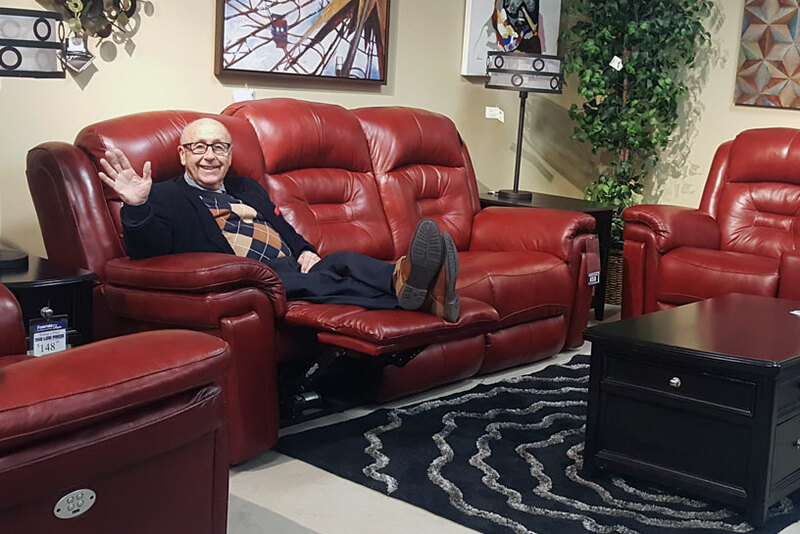 Furniture Fair Spokesperson Ed Hartman gets cozy on the Avatar Power Motion Sofa. Try this: Good news: the world’s coziest sofa doubles as a recliner and a charging station for your phone. The Avatar Power Motion Sofa has a built-in USB port, adjustable headrest, and automatically reclines at the push of a button. And best of all, it can comfortably seat at least three, meaning you don’t need to fight over the comfiest seat in the house! 3. Mood lighting: If you have drapes hung in any room of your home, you’re already hip to their mood-setting power. They’re good for saving energy, adding flair to a room, lighting filters through curtains beautifully and casting a glow upon the whole room. Play with light levels by layering curtains. Strategically placed lamps offer greater control of the mood. Throw in a few candles for a more intimate setting. Try this: Simple, stylish, and versatile, this 3-Lite Floor Lamp by Lite Source will add a happy glow and brighten up any dark corners you may have in your home. 4. Nature indoors: There’s something really comforting about the great outdoors, so why not bring the elements inside? Wooden accents do just that, and they’re trendy for rustic, chic home furnishing. 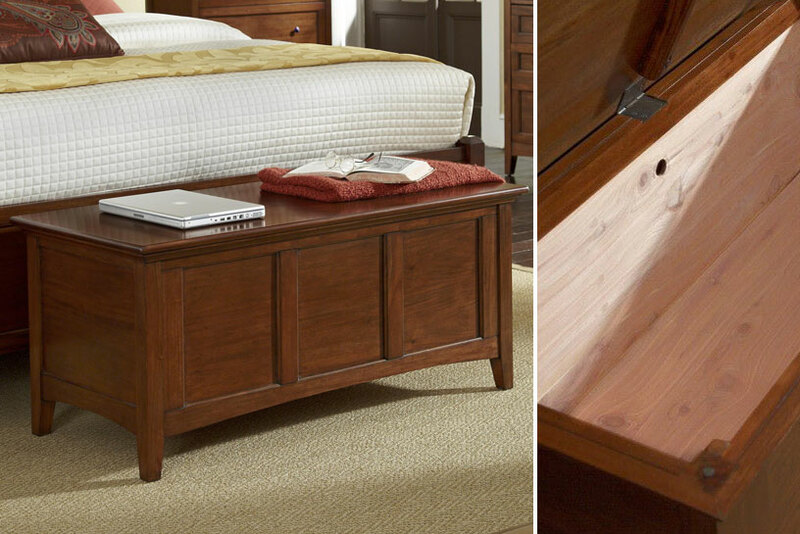 A wooden chest makes for perfect storage, extra seating, and more. Succulents, low-maintenance living plants, are all the rage and look great with any decorating theme. Try this: Modern in design, with American Shaker influence, this transitional Westlake Cedar Lined Trunk by Cherry A America is made out of sustainable solid mahogany. 5. Pleasing scents: Use the power of smell to create the mood of your choice instantly. Scented candles — think lavender and eucalyptus for relaxing effects — don’t just make the air smell nice; they also add another layer to the ambience visually. Got kiddos too young to be around open flames or cats who can’t be bothered to avoid them? Get creative with essential oil blends and pop them in an oil diffuser. Try this: Made of hand-forged metal and finished in antiqued silver leaf, this Loop-D-Loop Pair Of Candleholders adds sophistication to your favorite candles. 6. Plenty of blankets: Curling up on the sofa with a good blanket gets that much better when there’s one within arm’s reach. Kids and adults of all ages understand the importance of plush blankets, whether it’s chilly or you just need a little extra comfort. Plus, they can be used to soften harsh lines and sharp angles by throwing in some contrast. Toss a blanket over the corner of a couch to break up the boringness. Try this: Crafted in India, this Duke Black Stripe Throw by Loloi is reversible, cozy, and oh so sophisticated. 7. Textures and patterns: Mix up the furniture to add character and spirit to any setting. Marble, gingham, plaid, florals, and text all make for solid accents (pun intended). In cool weather, adorn the space with wool and fleece. In the warmer months, opt for lighter textiles like linen and cotton. Tip: Fair Isle, the unofficial pattern of winter, transforms any occasion from homey to hygge in an instant. 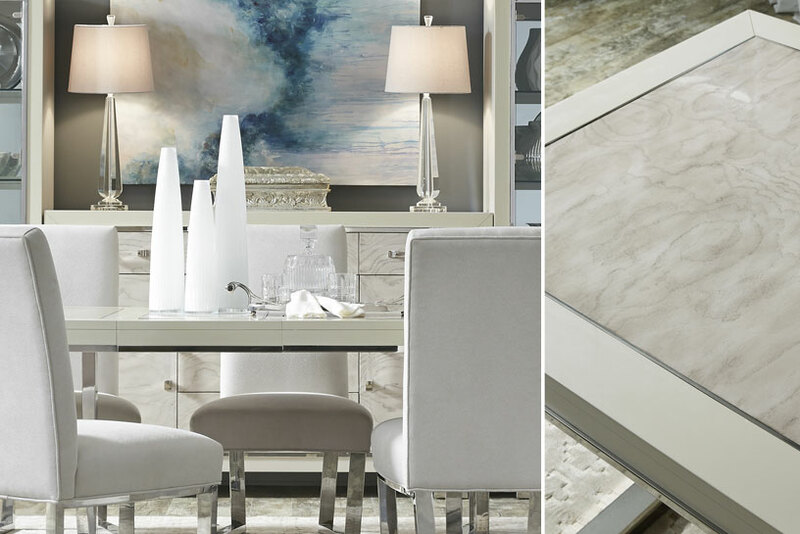 Try this: The Cydney Dining Set is the epitome of polished with its nickel finished trim and dramatic swirly white ash veneers. The acrylic hardware really brings the look home. 8. Details, details, details: The key to creating a cozy room is in the little things, but there’s a fine line between comfy and cluttered. Use accessories such as trinkets, mirrors, and artwork to fill in the empty spaces on side tables, mantels, and walls. Mix and match throw pillows of different sizes and place a faux floral centerpiece on the coffee table instead of magazines for a fresh, effortless look. Try this: Finished in beige, mocha, and a light wood tone, the Mia Accessory Package by Signature Design is a five-piece set featuring a photo frame, candleholder, large vase, medium vase, and small vase. Our award-winning designers listen, interpret your needs and desires, present creative possibilities and offer professional interior design advice to create your perfect solution. Design Destination provides trusted advice at every stage of the process. From concept development to placing accessory items. Our designers will work with your architect, provide space planning, custom window treatments and much, much more. Furniture Fair Continues Their Commitment to American Made With New Line Laurel Mercantile Co. Copyright © 2017 Furniture Fair. All rights reserved.